Choosing your wedding ceremony location is choosing the place where you make vows for the rest of your life - make it memorable.The actual wedding ceremony is where two people are united in marriage, this is why choosing the right ceremony location is important. Although traditions and customs vary, most ceremonies involve an exchange of wedding vows by the couple, presentation of a gift (ring, symbolic item, flowers, money) and an authority figure publicly proclaiming the marriage. Sometimes music, poetry, prayers or relevant readings from scriptures or literature are used in the ceremony. The signing of the registry or obtaining of a marriage license is what makes the marriage valid in the sight of the law. Evidently, it is the most critical part of your wedding so choosing its location is very important. You may want your guests, family and friends to all be present to witness the event. However, you may wish only to have one or two witnesses and to make it a very private affair. The more people involved obviously the more complex it will get. 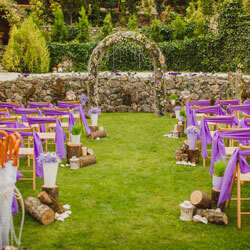 Many couples choose to have the wedding ceremony and the reception ceremony at one location (to the great relief of guests); others prefer to differentiate between the two events. For some, the wedding ceremony will take place on a different day to the reception. But whether it be in a civil registry office, County Hall, a little white chapel, an ornate synagogue, a public park or a hotel suite, the location of your wedding ceremony is significant. It is where you make your vows and start your new life as one together. The choices are so varied now it is hard to think of a ‘unique’ location; ironically, the most rare would probably be the most traditional! From boats and yachts, mountain tops, hotel suites, restaurants, parks, art galleries, museums to trains, nothing is off limit as long as the ceremony is legitimate. But remember it is about you both- not just what is ‘cool’ for the moment but what you are promising each other for the rest of your lives.